Well, he's at the Menil, the MFAH, and through the work of his followers, at the Sicardi Gallery. The big show is at the Menil, and features Torres-Garcia's work in wood. Torres-Garcia is mainly known as a painter, and that's partly because paint is the dominant artistic medium of the first half of the 20th century. There is also a sense that some of his work in wood is less serious than his paintings. And that's true! Because a lot of his wood art is in the form of toys. The standard artistic biography for a great artist of the 20th century is of a fellow who studied art, gained a certain degree of skill and even mastery, struck out on his own path to general incomprehension, starved in a garret (while bedding the occasional floozy and drinking absinthe with fellow members of the demimonde), slowly started to get recognition and sales until such time as he became a successful, famous artist. 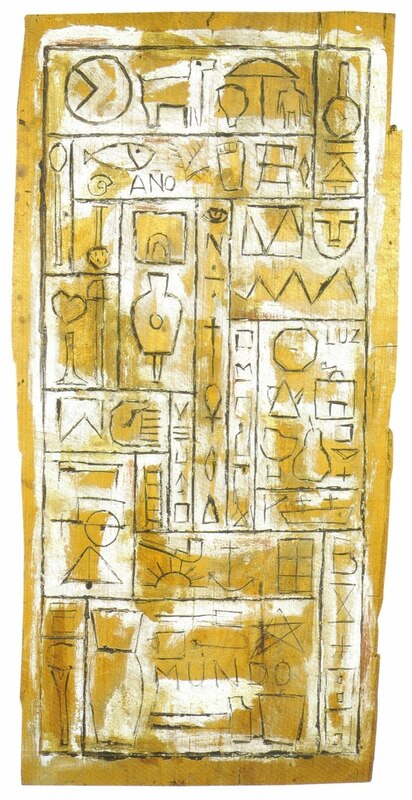 And even when you consider Torres-Garcia's compared to his fellow Latin American Modernists (Matta or Wilfredo Lam), his life course is odd. For one thing, Torres-Garcia was a lot older than Matta (1911-2002) or Lam (1902-1982). Torres-Garcia was born in 1872 and died in 1949. Also, even though like Lam and Matta he left his home country (Uruguay in Torres-Garcia's case) pretty early and stayed overseas for decades, he eventually returned home and finished his career there, which was not the case with Lam and Matta. 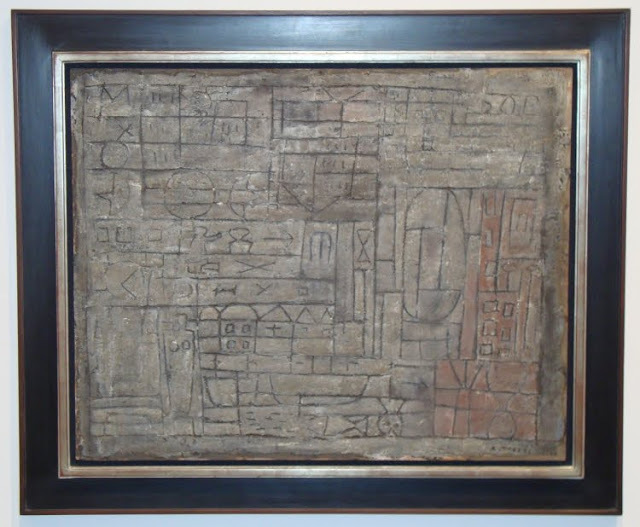 It took him quite a long time to reach his vocation as a modernist painter. He was initially influenced by Puvis de Chavannes, but by the teens his work is starting to look modernist. 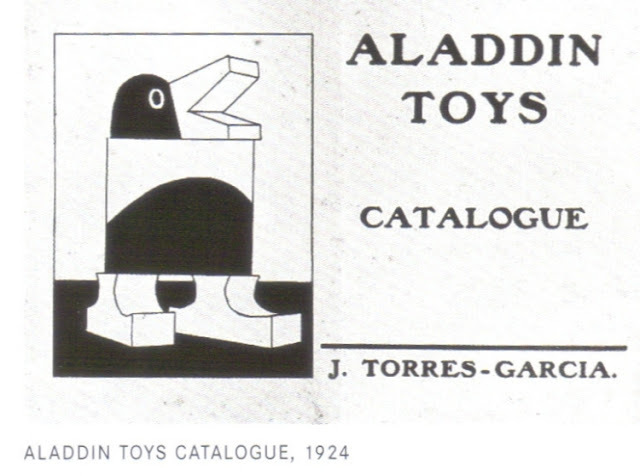 But being an artist wasn't paying the bills, so in 1920, he packed up the family and moved from Spain to New York City to become a toy manufacturer. Yes, manufacturer. He wasn't hand-crafting wooden toys, he was mass producing them. As you can see, they look quite modern. Parents who bought them for their children much have been rather sophisticated. And yet, at the same time, they have a homey, hand-made appearance. 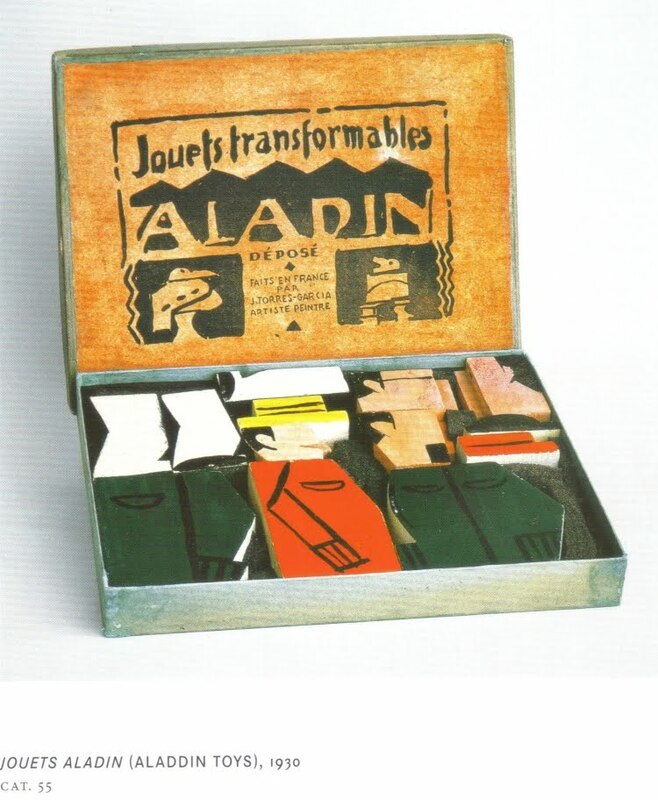 What is amazing about this is that the way he manufactured toys is perfectly reflected in his art. 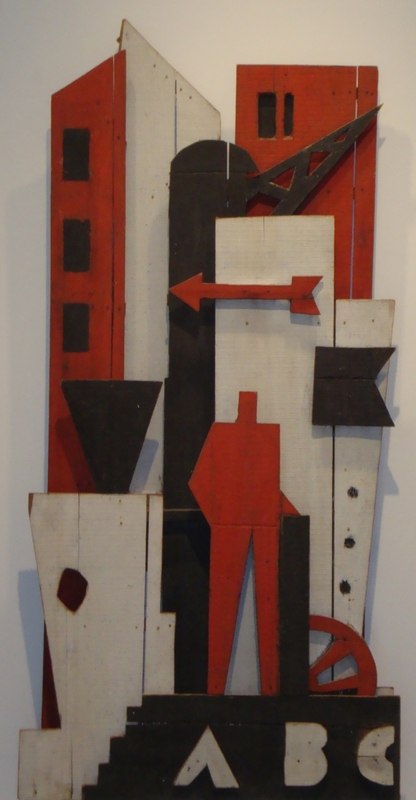 He was a "constructivist," which was the word that rather severe abstractionists called themselves. His peers and colleagues were people like Mondrian and Van Doesberg, whom he met in 1928. But he never quite liked the machine-like quality of his friends' geometric art, so even though he used a similarly limited pallette and rigid geometry, his work has rough, highly visible brush-strokes and includes recognizable symbols. The Menil show makes a good case for the importance of Torres-Garcia's wood constructions. My personal preference is for Torres-Garcia's painting, but as one can see at the Menil, it's impossible to say where wood ends and canvas begins. They all fit in his basic constructivist idea. Also extremely interesting is the Taller Torres-Garcia exhibit at Sicardi Gallery. In 1934, Torres-Garcia was convinced to move back home to Uruguay. There seems to have been an element of patriotism in his decision. Because so many young artists wanted to study with him, he rented a building next to his house in 1942, where he created the Taller Torres-Garcia (the Torres-Garcia workshop). It is some of these artists who are on display at the Sicardi Gallery. Many of these artists used wood constructions in a way similar to Torres-Garcia, often using cheap packing crate wood. The press release that accompanied the show correctly notes that Americans may try to relate these fairly humble wood assemblages to the assemblages of Robert Rauschenberg or Edward Kienholz--artist who used deliberately "poor" materials. But there was a different reason for their use of modest materials--cost! Uruguay is a country without forests--it is one big prairie, mostly given over to wheat or cattle production. Wood was a relatively luxurious imported item, so these artists, who wanted to emulate el maestro, had to use what wood that was at hand, typically low-quality wood from shipping crates. But this fits right in with Torres-Garcia's concept of constructivism. Even though Mondrian spent his last few years in New York City, constructivism never really took off in the U.S.A. But thanks to the influence of Torres-Garcia, it was a major strain in post-war Latin American art, as you can see if you look at the MFAH's Latin American collection.